Order a remote desktop plan based on the simplest way to get your Access Database on the Web. Run your existing Access Database without modification in the cloud, collaborate with multiple users, and access your application from any device. It’s as easy as cutting and pasting with Access Hosting. Please be sure to indicate which Version of Access you would like to have installed during the checkout process. If you have any other questions, please contact us. 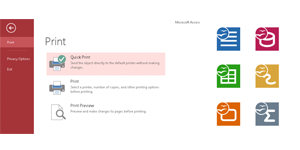 Move your Access 2010, or 2013 database running "as-is" to the cloud and collaborate with concurrent users without any modifications. 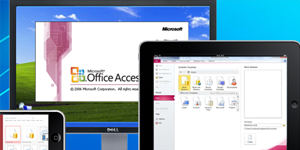 This plan includes the Access 2010 Runtime and Access 2013 Runtime along with OpenOffice for maximum productivity. Move your Access 2007, 2010, 2013 or 2016 database running "as-is" to the cloud and collaborate with concurrent users without any modifications. Connect to the cloud from any PC, iPhone, iPod, Android Device or web browser and experience the program as if it was running on your Windows desktop. 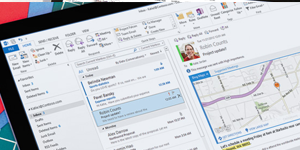 Do you have an advanced Access Application that integrates with Outlook email, Word, or Microsoft Excel? Get the full Microsoft Office suite with our Office Pro RDP hosting plan and access your database and files from any device and experience the program as if it was running on your Windows desktop. Our virtual desktop hosting easily allows multiple concurrent users to access the same database via any device (Windows, Macintosh, iPhone, iPad, Android, etc) from a web browser or using an RDP Connection. This is a full windows desktop machine rendered on any device that has the full functionality of Access 2010 in any HTML5 web browser. It will be instantly familiar to any Access Developer and is fully compatible with VBA Code and split databases.